The goal of the “Virtual Edition” of the New Computer Museum is twofold. It demonstrates the vision of what the “real” New Computer Museum has the potential to become, and it stands on its own as a valuable educational experience. This is particularly true because of the extensive material included in the “Guide” on this site (see right side margin). Finally, it is also an exploration of how the new wave of 3D tools can be used in the context of museums. The core of the New Computer Museum is a 3D interface. The application was created with the Unity3D game engine, so it requires a computer up to running AAA games (“triple A games”). An example of a machine that it will run on is an Intel® Quad Core™ i7-4700MQTurbo and a 3.4 GHz 4th gen NVIDIA GeForce GT 740M plus 16 GB RAM. All posters and almost all objects in the application link to content and interactive activities on the web. 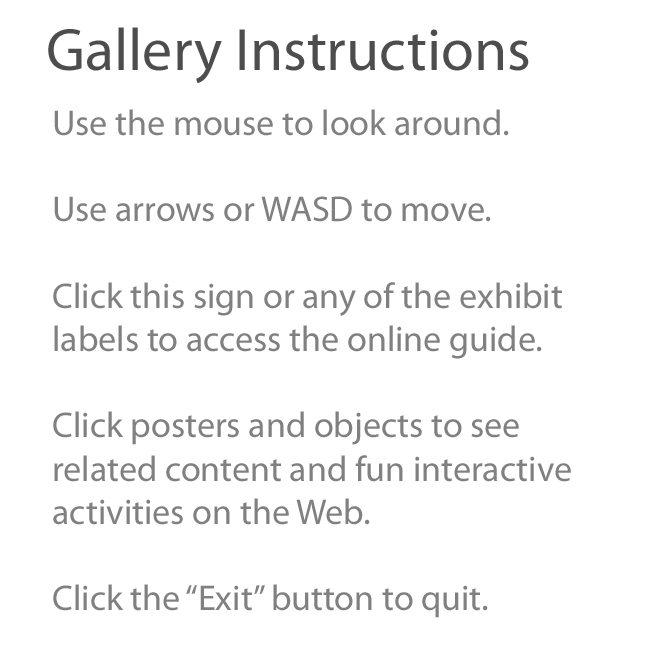 The “title poster” in each exhibit links to the appropriate page in the guide on this site, while other posters and objects link elsewhere. There is a high overlap between links within the interface and what you will find in the guide on this site, but there is not 100% correspondence. Here are a series of screen shots of the museum. Click the images to open corresponding pages in the New Computer Museum Guide.